This VisiKey keyboard is another great product that will reduce the strain on your eyes when working on your PC and make it easier to type. It features black keys with white print which makes for great contrast. If you’re sight impaired this keyboard will help you type and work with more ease. 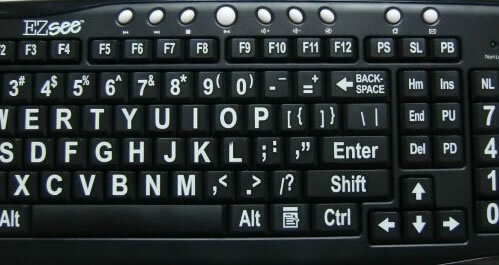 Letters are 430% larger than the letters you’ll find on a standard keyboard. 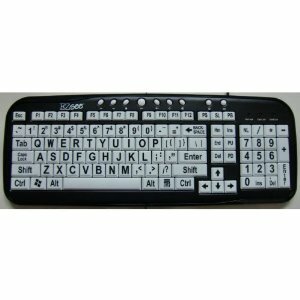 Black keyboard with white letters/numbers make it even easier to see what keys you are typing. 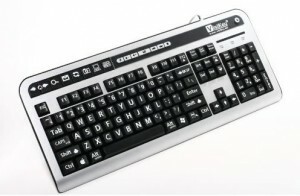 This keyboard also features media center and internet keys for easy access to frequently used tasks. It’s a standard 104 key model but with additional 15 hot keys.